CHARLOTTESVILLE, Va. (MARCH 6, 2016). Despite claims that helmets do not protect the cervical spine during a motorcycle crash and may even increase the risk of injury, researchers from the University of Wisconsin Hospitals and Clinics in Madison found that, during an accident, helmet use lowers the likelihood of cervical spine injury (CSI), particularly fractures of the cervical vertebrae. These findings appear in a new article published today in the Journal of Neurosurgery: Spine: "Motorcycle helmets and cervical spine injuries: a 5-year experience at a Level 1 trauma center" written by Paul S. Page, MD, Zhikui Wei, MD, PhD, and Nathaniel P. Brooks, MD. In Europe you're unlikely to find someone riding a motorcycle without a helmet; universal laws requiring motorcycle helmet use are applied throughout the European Union. In the United States, on the other hand, laws on helmet use vary from state to state, with some states requiring helmet use for all riders and others limiting the requirement to persons under the age of 18. According to National Highway Traffic Safety Administration (NHTSA) estimates, wearing helmets saved the lives of 1859 motorcycle riders in 2016; an additional 802 lives could have been saved if every motorcyclist had worn them. Wearing a helmet decreases the incidence and severity of traumatic brain injury during crashes. What then are the objections to universal laws requiring motorcycle helmet use? Major reasons cited for not requiring helmets while riding a motorcycle include freedom of choice, avoiding any limitation on vision, and a perceived increased risk of receiving a cervical spine injury (CSI). This last reason is based on the belief that the added weight of a helmet might increase torque on the cervical spine. Risk to the cervical spine is addressed in this study. Over the years there have been a variety of studies on helmet use and CSI in motorcycle crashes, with a couple of reports indicating an increased risk of CSI among helmeted riders and most studies finding no protective effect or harmful biomechanical risk to the cervical spine. Page and colleagues hypothesized that helmet use is not associated with an increased risk of CSI during a motorcycle crash and instead may provide some protection to the wearer. In this paper the researchers provide case evidence to support their hypothesis. At least one CSI was sustained by 7.4% of the riders wearing a helmet and 15.4% of those not wearing one; this difference in percentages is statistically significant (p = 0.001). 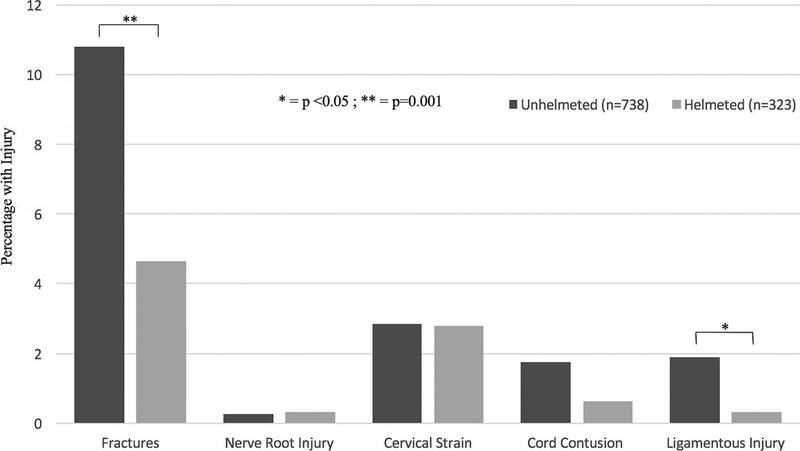 Cervical spine fractures occurred more often in patients who were not wearing helmets (10.8% compared to 4.6%; p = 0.001), as did ligament injuries (1.9% compared with 0.3%; p = 0.04); again these differences are statistically significant. There were no significant differences between groups (helmeted vs. unhelmeted riders) with respect to other types of cervical spine injuries that were sustained: nerve root injury, cervical strain, or cord contusion. In summary, Page and colleagues show that helmet use is associated with a significantly reduced likelihood of sustaining a CSI during a motorcycle crash, particularly fractures of the cervical vertebrae. Although the study population is small, the authors believe the results provide additional evidence in support of wearing helmets to prevent severe injury in motorcycle crashes. When asked about the findings, Dr. Brooks stated, "Our study suggests that wearing a motorcycle helmet is a reasonable way to limit the risk of injury to the cervical spine in a motorcycle crash." Page PS, Wei Z, Brooks NP. Motorcycle helmets and cervical spine injuries: a 5-year experience at a Level 1 trauma center. J Neurosurg Spine, published ahead of print March 6, 2018. DOI:10.3171/2017.7SPINE17540. Disclosure: The author reports no conflict of interest concerning the materials or methods used in this study or the findings specified in this paper.